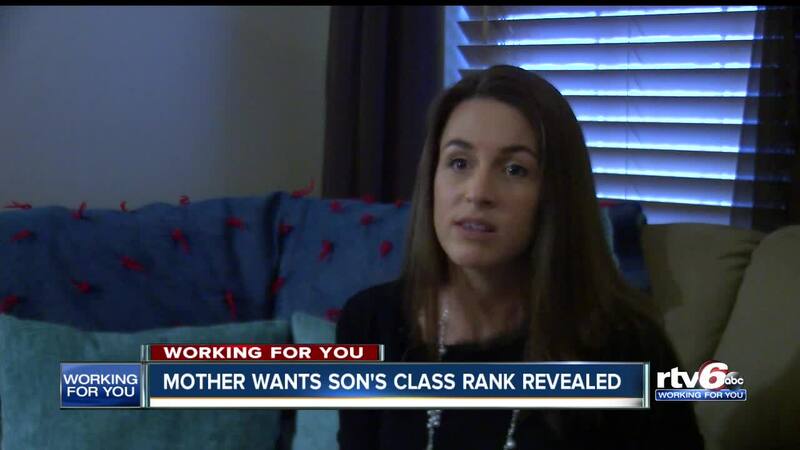 Mother wants son's class rank revealed. GREENWOOD — Lisa Rene and her son have started filling out applications for scholarships and college, and they're being asked to provide class rank. Something the district says they won't give her. "Going to college - getting a degree - is extremely important," Rene said. Rene is a single mother to three kids and says the difficulties she's having getting her high school senior's class rank is making applying to college a challenge. "Without that information he is at a barrier when it comes to scholarships, college applications," she said. Rene said she wants to know exactly where her son ranks and so far the district will only tell her he ranks in the top ten percent. "I think he earned it, he deserves it," Rene said. In a statement, a spokesman for Clark Pleasant Community School Corporation said district and high school "do not maintain individual class ranking as part of the transcript or student record." "I believe that is violating my FERPA rights," Rene said. "The right to inspect and review the student's education records within 45 days after the day the [school] receives a request for access." Rene has a theory about why rank is no longer being provided. "They thought it was a competition and it was hurting other kids feelings," she said. The district spokesman said if a scholarship or college needs class rank they can work with organizations that have a special circumstance. The International Affairs Program at IUPUI says it looks at academic performance, strength of curriculum, grade trends and class rank. "You're always competing in college - you're always competing in the work force for promotions," Rene said. The Rene's are looking at the Next Generation Hoosier Educator Scholarship, which can ask for class rank - requiring a student be in the top 20 percent for eligibility. The district still recognizes valedictorian and salutatorian and other academic honors. Rene says is the district doesn't provide her son's class rank by the end of the month she's prepared to file a lawsuit.